This photo expresses how much fun our office manager is having in our practice. With over thirty years of dental experience, Lina brings to the practice both her clinical and business expertise. She honed her familiarity with dental insurances with her past work in one of the nation's top dental insurance companies. She continues holding independent dental consulting jobs in her 'spare' time. Your questions and concerns will readily be answered, while enjoying her hilarity and easygoing manner. Tony, the only thorn among the roses, is hardly a thorn, chairside. Always cheerful, this Sunset district native, is gearing up to go to dental school. A B.S. 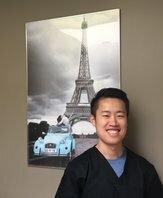 in Biology graduate from UC Santa Cruz, Tony's dental expertise is growing by the minute, gaining tons of hands on experience, while helping us out in all aspects of Dentistry.